The Arabian Oryx Sanctuary was formally established by Royal Decree No 4/94. It lies in Al Wusta Region and originally covered an area of 24,785.4 sq km. This vast expanse encompassed a diverse range of ecosystems, with features such as plains, sand dunes and hills. In addition to its topographical diversity, the area is rich in natural and cultural features. It also supports various plant and animal species such as the Arabian Oryx, Nubian Ibex, Caracal, Arabian Gazelle, Houbara Bustard and other animals. In recognition of its significant scenic and ecological value the Sanctuary was inscribed on the World Heritage List by UNESCO in December 1994. In 2007 the Government reduced the size of the area by 90% due to the dwindling numbers of oryx mainly due to poaching. The area was said to be too large to patrol and manage correctly. In June 2007 the sanctuary was deleted from the World Heritage List. The Daymaniyat Islands Nature Reserve encloses 203 sq. km. (20,300 ha.) of sea and seabed and includes the nine islands, rocks and reefs and offshore shoals situated 16 - 18 kilometres off the Seeb-Barka coast. The islands are an outstanding conservation area of national and regional importance. They have the highest density of nesting seabirds and the only known Osprey nesting sites in the capital area. They also shelter the largest nesting population of Hawksbill Turtles in the country. These are relatively unspoiled islands of great scenic beauty offering a living natural museum, including nesting Green Turtles and Sooty Falcons and a variety of reefs with high coral diversity. Both the islands and the reefs are important to the mainland based fisherman and people from Muscat, for fishing and recreational diving. This is the most important site for wildlife conservation in the capital area and should be managed to retain its values for wildlife, recreation and fisheries. Following a baseline survey of the Islands in April 2007 ESO found that the coral reefs had increased in size significantly (click here to download report ). In June 2007, the Sultanate was hit by Cyclone Gonu and unfortunately much of this coral growth was destroyed. ESO is now in the process of conducting a "post-Gonu" assessment of the reefs. The Jabal Samhan Nature Reserve in the Dhofar region of the Sultanate of Oman encompasses a track of limestone highlands, rising steeply from the coastal plain and sloping more gently towards the north. The Jabal, or mountain, has a 1,500 m escarpment which overlooks the Zalawt foothills and the plain of the Marbat - Sadh peninsula. Jabal Samhan Nature Reserve consists of an array of barren, scalloped peaks separated by deep wadis and canyons. These deep wadis contain rare and unique plants such as Caralluma sp. and Anogeissus dhofarica. Most of the wadis contain water pools where the rare wild animals like the Leopard, Ibex, Gazelle, Striped Hyena, Foxes and Wolves come to drink. The coast between Ras Nuss and Ras Qanawt is dominated by rugged steeply shelving volcanic jabal, interrupted by several medium sized beaches. Crayfish and abalone occur in the sublittoral zone and good populations of Green and Loggerhead Turtles nest on the beaches. The Reserve also includes Jabal Habrer which catches the influence of the Khareef (monsoon). As a result a small area of Anogeissus dhofarica has developed and also present is the only location of Pappea capensis on the Arabian peninsula. Khawr Baleed was proposed as a National Nature Reserve by the IUCN in 1986 and then again in 1990. A concept development plan was completed in 1995 suggesting the establishment of an Archaeological Park. This park is located within the municipality of Salalah in the Governorate of Dhofar, Sultanate of Oman. The park contains the archaeological remains of Al Baleed, an important medieval trading city. Its site is of great importance in the history of Oman. The establishment of Al Baleed Archaeological park has three fundamental goals. First, and most important, it must provide for the preservation of the natural resources. Second, it aims to develop an education program to inform visitors of the significance of Al Baleed in the history of Oman. Third, it should seek to increase tourism to the site. Khawr Sawli is located 30 km east of Salalah. It was fenced in 1992 due to reports of camel deaths at this khawr. The fenced area included some prominent archaeological sites. Investigations reveal a great diversity of fish and birds in Khawr Sawli. The vegetation of the khawr is in a very poor condition due to extensive grazing by camels that enter through the open gates and broken fences. Quarries of limestone have occurred on the west of the khawr and plots for limestone quarries have been allocated to the north-west of the khawr. These activities are incompatible with the accepted norms for tourism and has degraded the tourism potential. Khawr Rawri is the largest of the proclaimed khawrs along the Salalah coast measuring 2.5 km long and up to 400 m wide. Khawr Rawri provides an important habitat for birds, fish and a representative sample of the vegetation of the gravel plains under the influence of the Khareef. Khawr Rawri is better known for the very important archaeological site on its banks, Samharam. Khawr Awqad is situated in Salalah and is under increasing threat to become a waste dumping place in the near future. The khawr was not zoned as a conservation area in the Subregional Land Use Plans and it was not included in the IUCN proposals for protection status. The increasing demand for land to expand housing in Salalah will gradually threaten the existence of this khawr. The khawr is an important bird site and also an important source of fresh water for the irrigation plots adjacent to it. Oman's Turtle Reserve combines the previously proposed Ras Al Hadd National Scenic Reserve and the Ras al Jinz National Nature Reserve and encloses 120 sq. km. (12,000 ha.) of beaches, shorelands, adjacent sea and seabed and two khawrs. Approximately 13,000 Green Turtles nest on the complex of beaches included in the Reserve. The beaches, which attract the greatest number of nesting Green Turtles in the Sultanate, are of national, regional and global importance for the survival of this endangered species, and form the principal justification for the establishment of the reserve. The turtles of the area are threatened to an increasing degree by human activities. Nets and boats on the nesting beaches interfere with the nesting activities and nearshore nets block the access to nesting beaches. Camping on or near the beaches cause a disturbance and the village lights attract the nestlings. The Reserve includes a great number and variety of archaeological sites of significant importance. The research on these sites and the protection of such sites from future development needs to be addressed. The two khawrs and the cliffs along the coast are important bird areas and the protection of these as well as the limited stand of mangroves in Khawr Al Jaramah is important. Oman LNG has provided RO 1 million in funding to the government in order to build a visitor's centre acting as an entrance to the reserve. The Centre is due to open in late 2008. Saleel Nature Reserve (protected under Royal Decree Decree No. 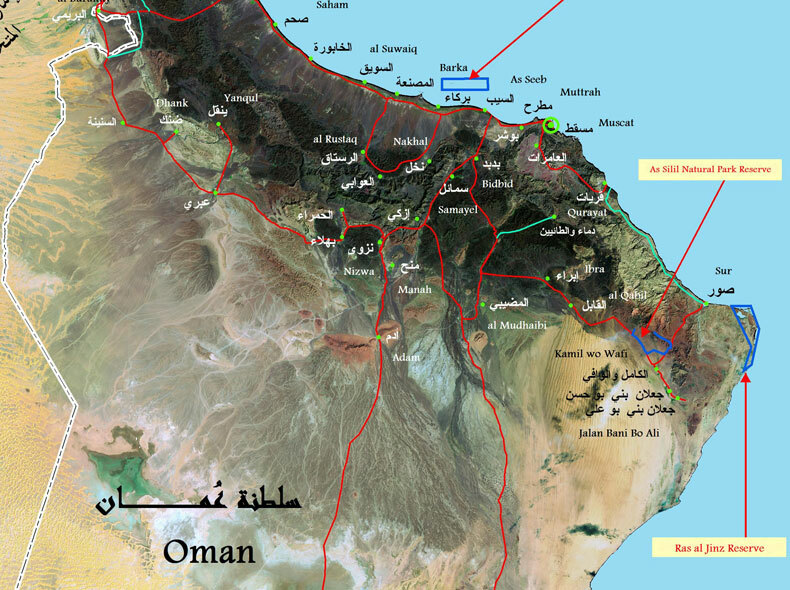 50 / 97 on 28 / 6 / 97) lies in the eastern region of Oman between Badyiah and Sur. The 220 square kilometers consists of a series of mountainous and rocky plains as well as some valleys and high hills. The Reserve is home to deer and wild cat and some local and migratory birds. Small (Qurom Khawr) is located at a distance of about 10 kilometres west of Salalah. 300 m long and 50 meters wide, it is almost rectangular in shape. The trees of Crimea (Platoon alartdiat) is dominant, and is limited to the sides of the khawr. There are also Phragmites australis as well as Cresa cretia, Aleuropus, lagopoides, Sorobolus virgineus and Alrsasiat. Due to overgrazing, the area has been fenced and since the establishment of the fence the trees have started to recover. The Large (Qurom Khawr) is also located in the city of Salalah. The vegetation surrounding Khawr is in very bad condition due to continual camel feeding and over-grazing. Khawr Dahareez on the eastern outskirts of Salalah was proposed as a National Scenic Reserve by the IUCN in 1986 and as a Nature reserve by the Planning Committee for Development and Environment in the Governorate of Dhofar in 1993. This khawr is an important refuge for migrating birds. The invasion of alien plant species such as Prosopis juliflora is the most prominent and visible threat at the moment. 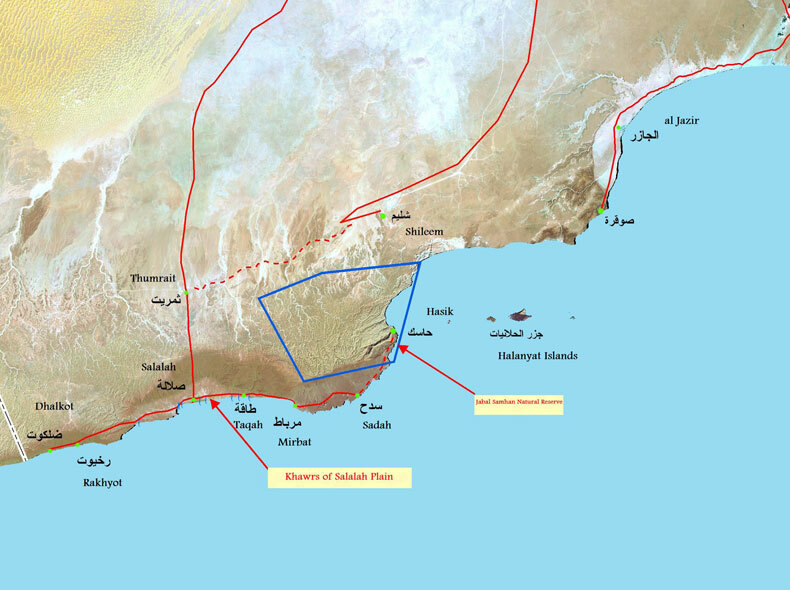 Khawr Taqah is located immediately west of the town of Taqah about 30 km west of Salalah. This khawr, with a large deep freshwater body fed by a spring, has a permanent connection to the sea and an outflow of 140 l/min. The khawr has a high diversity in bird and fish life.